Hello hockey fans! We're back with another update for this season's Plus/Minus Arena Report. We want to keep you up to speed again this season on arena and franchise changes in the world of North American college, pro, and junior hockey. University hockey is underway in Canada and college hockey is starting to ramp up in the States. We will bring you arena changes in NCAA Division 1 as well as the Canadian leagues and also list alternate venue games. We will save the outdoor games for another report. 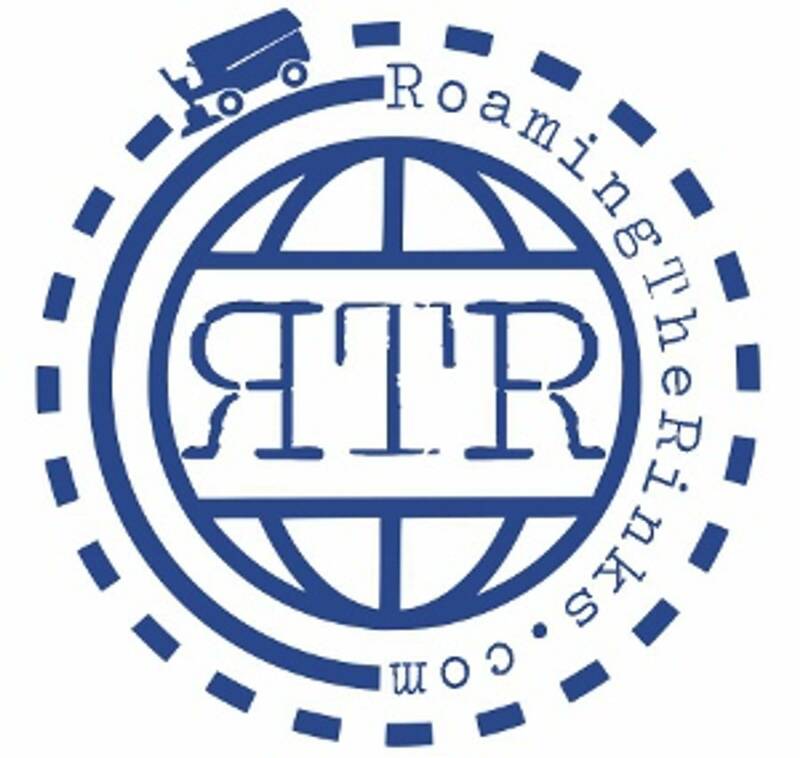 Hopefully this info will be used to plan your hockey travels, and maybe you will have the chance to attend a game in a place that you hadn't thought about before. The Canadian University system houses some competitive hockey from coast to coast. This season there are no new teams coming on board, and no venue changes for this season, although there are arenas in the planning and construction stages for Dalhousie University in Halifax, University of Alberta, and University of Saskatchewan, so there will be some new buildings opening in the coming seasons. We love CIS hockey with its allowance for former pros to play, the use of the visor instead of the cage, and the lack of pretenses that are so common in the NCAA. Rogers K-Rock Centre Kingston, Ontario. Kingston universities Queen's and Royal Military College will do battle in a cross-town rivalry at the home of the OHL's Kingston Frontenacs on November 17th. TD Place Arena Ottawa, Ontario. National capital universities Carleton and U. of Ottawa will do meet in the home of the Ottawa 67's and former home of the NHL's Senators on February 11th. Nanaimo Ice Centre Nanaimo, British Columbia. Vancouver Island University's Mariners will field a BCIHL club this season, and will call this arena home. The Alberta Colleges Athletic Conference is a steady league that flies under the radar a bit. The same 8 schools will call the same arenas home again this season as far as we can tell. In Quebec the RSEQ, also known as the CEGEP League is overlooked a lot, but has some interesting venues. Twelve teams from across the province make up the league and the quality of play is decent and entertaining. The NCAA is an old, slow moving institution which sees little change from year to year. Conferences such as the ECAC have several old, timeless arenas. 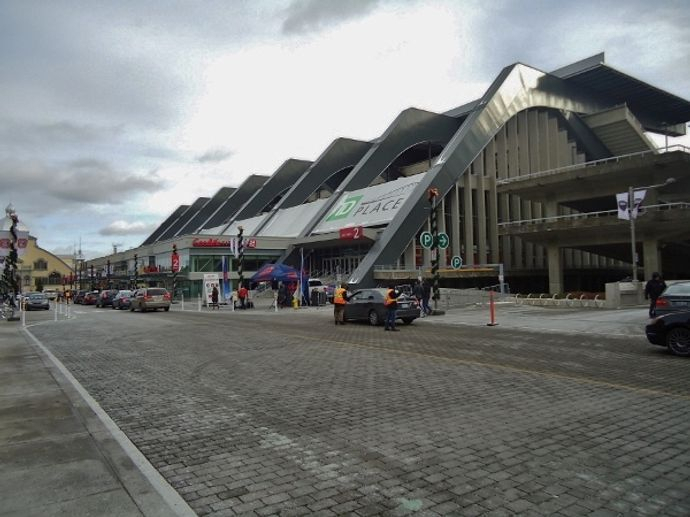 With no new teams coming on board and no new arenas opening this season fans will have to wait until either new schools start a hockey program or new venues are built. There are quite a few neutral site or one-off games each season however, with many being reoccurring events, and some new ones popping up from time to time. We will cover those venues in the Bonus Plus category. Resch Center Green Bay, Wisconsin. Folks love their hockey in Wisconsin, and the Wisconsin Badgers will take on Northern Michigan in Green Bay at the home of the USHL's Gamblers on October 20th and 21st. Gila River Arena Glendale, Arizona. Arizona State was the most recent school to jump on the D1 train, and they will play a couple games at this NHL venue, including November 17th and 18th, and January 20th. Cross Insurance Arena Portland, Maine. Portland is in between pro teams with the AHL leaving a while back and the ECHL due to arrive next Fall. Maine Black Bears fans can catch a game against BU here on November 18th. DCU Center Worcester, Massachusetts. Holy Cross has been rumored to make the jump to Hockey East for a while now. They will play at the venue formerly known as the Worcester Centrum to test the waters of big time arenas on November 24th and 25th. Madison Square Garden New York. 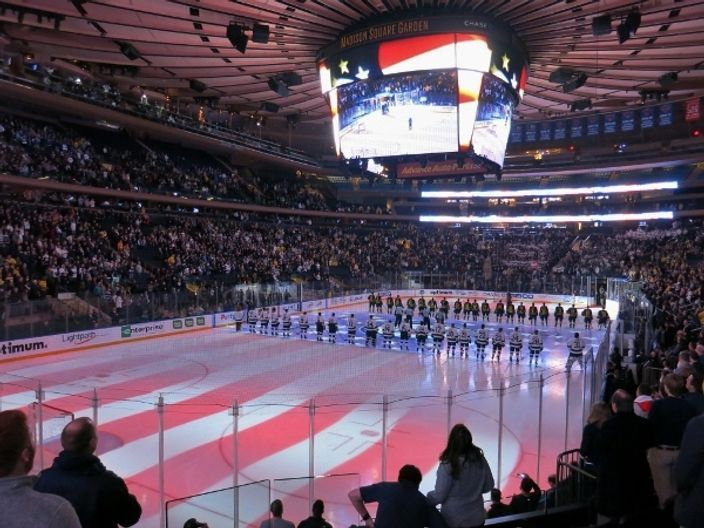 Best known as the home of the New York Rangers, MSG usually hosts a couple NCAA games annually. This season college hockey will take place in the Big Apple on November 25th as Cornell takes on BU, and again on January 20th with Midwestern teams Minnesota and Michigan State taking the ice. PPG Paints Arena Pittsburgh, Pennsylvania. The home of the Penguins will host Robert Morris on December 8th, and then the annual 3 Rivers Classic on December 29th and 30th including RMU, Lake Superior, Arizona State, and Providence. T-Mobile Arena Las Vegas, Nevada. Vegas will not only see the NHL this season, but also a college tourney on January 5th and 6th. Nassau Veterans Memorial Coliseum Uniondale, New York. 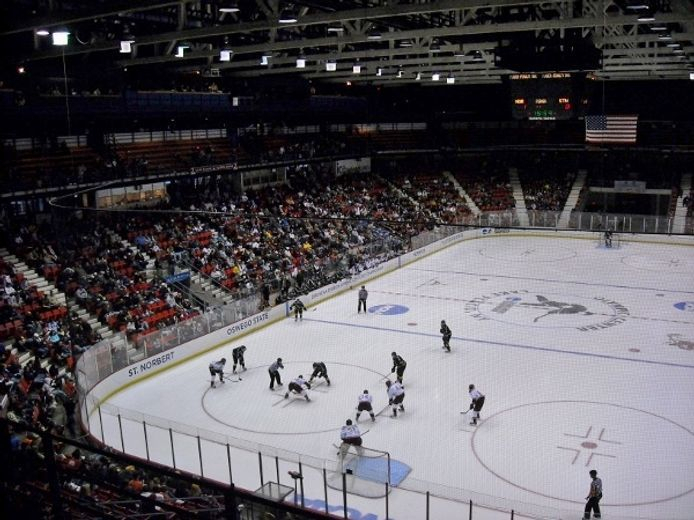 The newly renovated home of the Islanders will see Army take on Sacred Heart on January 6th. Times Union Center Albany, New York. Albany saw the AHL leave town in the spring, but will still have a single game at Times Union Center as RPI and Union play for the Governor's Cup on January 27th. TD Garden Boston, Massachusetts. Hardly a Bonus Plus venue as the Beanpot has been going on the first 2 Mondays of February for over half a century, fans can catch college hockey here for the iconic tournament as well as the Hockey East Championship in mid-March. Little Caesars Arena Detroit, Michigan. 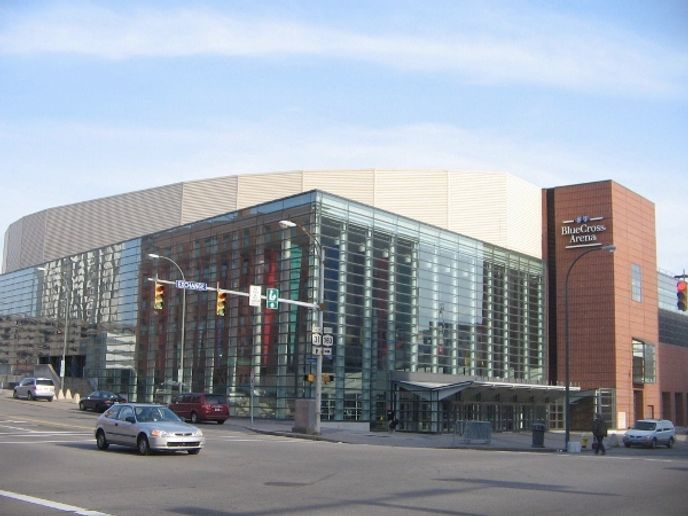 The new Red Wings venue will try to pick where Joe Louis Arena left off and will see college hockey in Detroit as Michigan takes on Michigan on February 10th to hopefully start a new tradition. Herb Brooks Arena Lake Placid, New York. The home of the Miracle On Ice sees a few college games each season, and this season the ECAC Tournament will return in Mid-March. Xcel Energy Center Saint Paul, Minnesota. The NCHC will have their season ending Frozen Faceoff in the Twin Cities again this season. The NCAA provides fans with an excellent hockey experience. Catching a game at one of these Bonus Plus sites may not have the same feel as an on-campus venue, but can be fun. Many of the alternate sites have become traditions that many fans plan their travels around. If in Canada you may have overlooked CIS hockey, but should check it out if you have the chance. Regardless of your hometown, perhaps you can decide to take in some hockey at one of these venues this season. We will be back with reports on NCAA Division 3 and lower level college hockey, as well as a report on outdoor games. Hockey season is here! Get out and catch a game this weekend.